Affectionately known as “Mr. 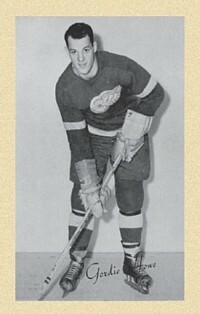 Hockey,” Gordie Howe was famous for his scoring prowess, physical strength, and longevity. The only person in hockey history to have competed in six different decades at the professional level. 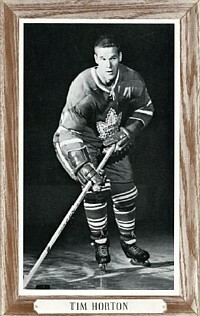 Billy Harris was a twenty year old rookie centreman with the Toronto Maple Leafs when he saw his photo on a Bee Hive in 1955. He subsequently went on to play ten seasons with the Leafs and was a contributing member of three consecutive Stanley Cup winning teams. He clearly met his challenge of becoming a member of the “Bee Hive” collection. Today for collectors like myself, the challenge of Bee Hives is not to become a member of the set, but rather to complete the Bee Hive collection! At this point, you may be asking yourself, “What on earth are Bee Hives?” The answer is simple. Bee Hives are 4 1/4 by 6 3/4 inch black and white photos of hockey players mounted on 5 3/8 by 8 inch coloured mats (red, blue but most often beige). For more than thirty years these pictures were available from the St. Lawrence Starch Company in Port Credit, Ontario to generations of hockey fans in Canada. Because Bee Hive Golden Corn Syrup was the Company’s most popular product and the most frequently submitted label, the hockey photos naturally became known as “Bee Hives”. When they first appeared in 1934, television had not yet been commercially developed and radio broadcasts provided the only live coverage of N.H.L. games. Bee Hives allowed listeners from all over Canada to “see” the players that were playing in the game that Foster Hewitt was describing from his famous gondola high above the ice at Maple Leaf Gardens. Collecting Bee Hives used to be very easy. One merely had to send a request along with a proof of purchase from one of the Company’s products to the St. Lawrence Starch Company and then await the treasured picture’s arrival in the mail. There was never any suspense involved with Bee Hives for unlike a sealed pack of bubblegum cards which one buys without knowing its actual contents, Bee Hive photos were ordered by the player’s name. For this reason, Bee Hives of the “star” players and those that enjoyed extended careers are found in abundance today. It’s the pictures of players who had very short N.H.L. careers that provide the greatest challenge for Bee Hive collectors. Hazen McAndrew, for example, played in only a handful of N.H.L. games yet he happened to be there on “picture day”. His Bee Hive photo is extremely rare. No doubt, close friends and relatives of McAndrew would have sent away for his picture, but apparently very few others did. 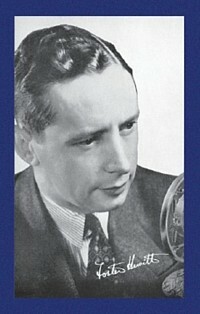 For forty years, Foster Hewitt, “The Voice of Hockey”, was Canada’s premier hockey play-by-play broadcaster. He coined the phrase,"“He Shoots!… HE SCORES!" Almost seventy-five years have passed since the first Bee Hives were mailed and the challenge of collecting them today is much greater, but at the same time a lot more fun. Most people that I have met through collecting have been really nice and enjoy sharing their reminiscences about hockey from the “good old days”. Probably what makes the task of collecting Bee Hives the most daunting is that no definitive checklist exists and no one really knows for certain how many pictures there are in the complete collection. (The belief shared by many longtime collectors is that there are approximately 1,030 distinctly different Bee Hive hockey photos.) Throughout the years of the promotion, the Company did provide lists of available photos from which the hockey fan could choose his or her favourite players. One would think that it would be a simple matter of compiling the lists to arrive at the total number of photos in the collection. However, the lists indicate photos that have never surfaced! Do they exist or not? Collectors who refer to these mystery pictures as “Unconfirmed” photos believe that they do not exist. What probably happened is that the lists were prepared by someone other than the actual photography company that was contracted to take the pictures and the “unconfirmed” players’ pictures were never taken. 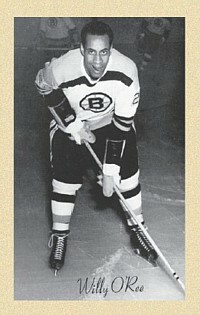 Willie O’Ree made his NHL debut with the Boston Bruins on January 18, 1958, against the Montreal Canadians, becoming the first black player in league history. The Bee Hive promotion was so successful that as many as 2,500 photographs would be sent out each morning from the Port Credit office. Apparently requests, accompanied by the required proof of purchase came from all across Canada and even some points in the U.S.A. where St. Lawrence products were not even available! Largely as a result of the hockey picture promotion, the sales of Bee Hive quadrupled through the 1930’s and it became the largest selling corn syrup in Canada. Co-founder of Tim Horton’s, Canada’s largest coffee and doughnut store chain, Miles Gilbert “Tim” Horton played 22 seasons in the NHL and was inducted (posthumously) into the Hockey Hall of Fame in 1977. Unlike conventional hockey cards, Bee Hive photos are not numbered nor do they have any writing on them other than the players’ names. To me this is part of their simple charm because it encourages the collector to research the players’ backgrounds and the era in which they played hockey. In order to simplify the cataloguing of the photos, collectors have grouped Bee Hives into three groups or generations according to the period of time in which they were produced. Group I photos are from 1934-44, Group II from 1944-63, and Group III (“Wood grains”) from 1963-67. Group I photos were issued continuously from 1934 through the 1943-44 season. Not even World War II could end the promotion, although it did affect it. During the war years, pictures were “rationed” due to higher costs and the Company decided not to issue new picture lists or to proceed with the production of new pictures until the war situation became more stable. During the war years, the Company did, however, expand the successful promotion somewhat by offering photos of “R C F and R C A F. Aero planes” done in a similar format as the hockey photos. Following the end of World War II, the players’ photographs were updated beginning with the Toronto Maple Leafs. An oversize team photo of the 1944-45 Toronto Maple Leafs Stanley Cup Champions was also produced. New photos were gradually added year by year until 1948, when the up-dated series was completed. These Group II photos were available from 1944 to 1963. As the Group II photos began so they ended, with an oversize team photo of the 1962-63 Toronto Maple Leafs Stanley Cup Champions. In 1964, the appearance of Bee Hives changed radically. They became a one-piece photo on a heavier card material and were framed with a wood grain trim. The players’ names were inscribed in a nameplate at the bottom centre of the border. This Group III format, known as “Wood grains”, continued until the end of the promotion in 1967. 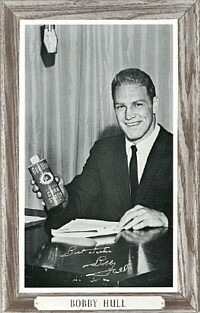 In addition to leading the Chicago Black Hawks to their last Stanley Cup victory in 1961, “The Golden Jet”, Bobby Hull, served as a spokesperson for the St. Lawrence Starch Company and Bee Hive Corn Syrup. Because the promotion ran so long and people could request the particular photo they wished, it was inevitable that the Company would run out of photos of the more popular players. This situation lead to “variations” of photographs which to the dedicated collector heightens the challenge and fun of striving to complete the set of Bee Hives. When the Company opted to simply reprint an old photo, “variations” resulted when the script was changed to a different type face or was placed in a different position on the photo. Five distinct Wood grain “variations” occurred when the photos of players were accidentally printed with the negative reversed whereby the players’ pictures came out backwards. Can you imagine Bobby Hull’s famous booming slap shot being delivered by a right-handed shooter? 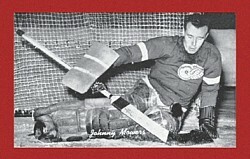 In 1943, Johnny “Mum” Mowers backstopped the Detroit Red Wings to the Stanley Cup, was deemed a 1st Team All-Star and captured the Vezina Trophy as the NHL’s best goaltender. Another source of Bee Hive “variations” resulted from old photos being “cleaned up”. The photographs were often “doctored” to create a more visually appealing picture. Photos were cropped differently or backgrounds that were too dark were eliminated entirely creating a completely white background or sometimes the boards which surround a hockey rink were “painted in” to create a more realistic setting. With the conclusion of the 1966-67 hockey season, the Gray family, owners of the St. Lawrence Starch Company ceased the production of Beehives. Times had changed and it had simply become too expensive to continue. The formation of the N.H.L. Players’ Association and its demand for a phenomenal increase in the fees for the right to pictures of its players and, the N.H.L. doubling in size from the “original six” teams to twelve teams had necessitated the end of the promotion. Even in today’s world of seemingly endless advertising hype and massive promotion of virtually everything, the St. Lawrence Starch Company’s promotion of its products through Bee Hive photos borders on the remarkable. It must surely rank as one of the most successful and enduring marketing promotions of all time. After all, the promotion ran for 33 years and as far as I am concerned, it has never ended! If anyone would like further information about Bee Hives or could help me in my pursuit of completing my Beehive collection and learning more about the St. Lawrence Starch Company, I would love to hear from you. Please feel free to phone me at 705-435-9707 or drop me an e-mail at: thepillars@sympatico.ca. Antique67 ...the Canadian web site where you can find over 1000 antique and collectible dealers and markets, locate antique and collectible shows and auctions, read articles about your favourite collectibles, find antique repair, restoration, re-finishing & reupholstering shops, buy or sell antiques and collectibles in a classified section or purchase price guides, books, magazines and newspapers.